Gosh, does it seem like Halloween has turned into a whole week of activities? What’s up with that? We have had parties, haunted houses, a trip to the pumpkin patch, we’ve carved the pumpkins into elaborate designs, baked and decorated Halloween cupcakes… and now the class party! I’m exhausted and we still have trick or treating tonight. Seriously?! Since I’m the room parent for my son’s class, I’m in charge of his class party. I want to dress festive- but also not embarrass him (he is in 5th grade and pretty much everything I do is embarrassing), so rather than wearing a costume- I’ve opted for jeans and an orange sweater. It’s appropriate, yet not ridiculous. Speaking of ridiculous, do you remember those awful sweaters with the applique? Yikes! 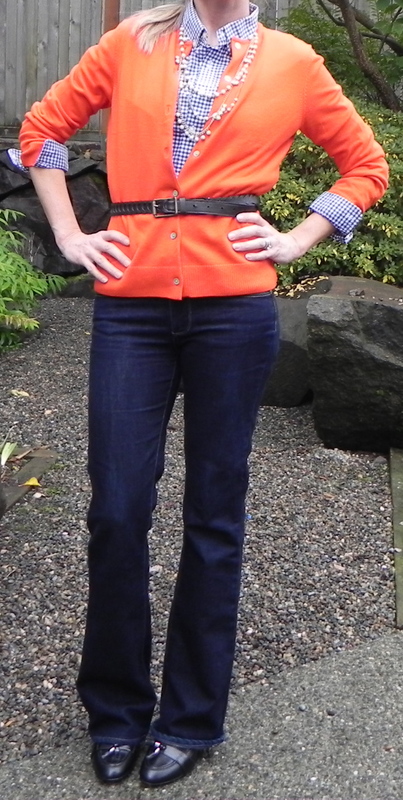 I’m wearing my Paige Premium denim jeans with a bright orange cardigan. On the right I’m showing the cardigan with just a plain shirt. There’s nothing wrong with this look, but it just seems a little plain. On the left I’ve re-worked it with a blue and white checked shirt, added a necklace and a belt. Below I’m showing the same look, but with the sweater open… not sure which look I like better. What you do think? I’m off to school… have a Happy (and safe) Halloween! Which is better? Buttoned or unbuttoned? good one, i like it. Just found your blog from Glamamom’s link up. I love it! I wear J. Crew and other casual stuff too. As a 40-something mom in Los Angeles, it’s always a challenge to look good and be comfy. open the sweater I think! Love the unexpected combo of orange and blue gingham. Ever feel like any orange article of clothing you own should only be worn on Halloween? I’m diggin’ the belted look, too! I like it unbuttoned the best! Love the color combo! Visiting from Monday Mingle. I would be fine if it was ‘a week’ with us turned out to be more like a ‘whole month of Halloween activities’. So much that the kids were a bit confused tonight was the actual Halloween! I love the blue checkered shirt combo open with the pearls. Perfect festive but not over the top outfit. Not looking forward to my son being embarrassed by my clothes. Both look good but I think open is just a tad better, shows more pattern and looks nice with the belt. the brown boots & striped shirt are my second fav from the month of Oct.
You real have great style and make it look so effortless!